Even if you're the dogmatic kind, you have to admire RSc's total grasp of Shakespeare's works. The Complete Deaths of William Shakespeare—The Dead and Dying Make for Live! 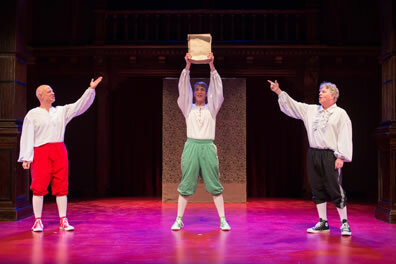 Reduced Shakespeare Company and Folger Theatre, Washington, D.C.
From left, Reed Martin, Teddy Spencer and Austin Tichenor, all members of the Reduced Shakespeare Company, display the manuscript of William Shakespeare's Long Lost First Play, which the players abridged for its world premiere at the Folger. Below, the three play the Weird Sisters. Photos by Teresa Wood, the Folger. Puck and Ariel don't like each other. Well, they may actually be in love, but being sworn enemies, they try to out-trickster each other. They force Hamlet into a series of decisions he can't make (they put a hair piece on the skull he's holding: "Toupee, or not toupee," he says; they hand him a marijuana joint: "Doobie, or not doobie"). They remove Richard III's hump, they spirit Dromio from Greece to Italy, and they hook up Hamlet with Lady Macbeth, Falstaff with Juliet, and Richard with Beatrice, who later hooks up with Kate. Cardenio is forever lost in a great tempest during which Pericles' baby goes overboard (apparently not intentionally). Petruchio is the puppet who becomes a little boy, and there's much to do by a guy named Dale. Ariel turns Oberon against Puck. Puck enlists the three witches to cross Ariel. The three witches convince Malvoliago, the evil Puritan, to shoot Ariel with an ancient pistol, but the bullet finds Puck instead. Ariel, professing her love for Puck, brings him back to life with enthusiastic applause from an audience who believes in fairies. William Shakespeare really wrote all this, or so the Reduced Shakespeare Company would have you believe. It was Shakespeare's very first play, which he wrote at age 17. The RSC—um, maybe we need to alter that acronym so as not to confuse it with the Royal Shakespeare Company; so, because the Reduced Shakespeare Company comprises only three members (Reed Martin, Austin Tichenor, and Teddy Spencer) we'll use a lower-case c for Company. The RSc discovered the manuscript of this long-lost work in a Leicester, England, parking lot next to a bunch of old bones. And what a manuscript it is! A thousand pages, hundreds of scenes, some 1,300 characters, and a plot so convoluted Shakespeare calls upon himself to extricate us from it: "I wrote myself into a corner, and I wrote myself into the play to get me out of." If performed in full the play would run 100 hours, which is why RSc cut and condensed the thing. And so we get William Shakespeare's Long Lost First Play (abridged), "Shakespeare's first fauxlio." 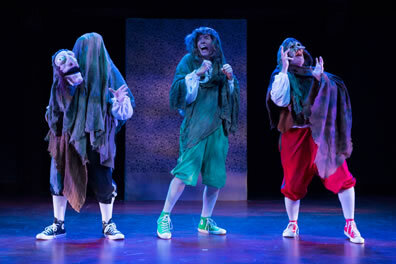 On William Shakespeare's 400th "Deathiversary" (quoting RSc here), the Folger, which has "the largest collection of Shakespeare crap in the world," is presenting the world premiere of the Reduced Shakespeare Company's latest epic silliness. The company that launched to fame and became a Shakespeare festival favorite with The Complete Works of William Shakespeare (abridged) in 1987—and has since presented abridgments of the Complete History of America, All the Great Books, and The Word of God among its nine stage shows—wanted to mark this celebratory year by somehow recapturing the lightning in a bottle of its original condensed take on Shakespeare. Sparking the idea for this play was the company's 2010 private tour of the Folger Library vaults when Head of Reference Georgianna Ziegler told them that her "holy grail would be to find an actual manuscript of a Shakespeare play in his own hand." So, RSc found Dr. Ziegler a holyish grail. The premise allows co-authors and co-directors Martin and Tichenor to both honor and send up Shakespeare's works while displaying their vast knowledge of the canon—including the plays' thematic arcs and nuanced character qualities—and mash them into an entirely new plot that layers in even more themes and nuances. From the opening line—a cloaked and hooded Chorus intoning, "O, if the muse of fire be the food of love, let's eat"—to the end with Puck telling us in his epilogue, "If we players have offended, tough luck you all attended," this production is a staged Where's Waldo played as Wherefore's Willy (and, yes, there's a wherefore-where joke in the show). They know they are treading on sacred ground: they even take a stab at Shakespearean scholars, figuring two disgusted ones are in the audience even now. Ah, but even if you're the dogmatic kind, you have to admire RSc's total grasp of Shakespeare's works as Martin and Tichenor weave lines together from a wide range of plays and a wider range of characters into single lines of dialogue. This is not a new concept: Bob Carlton did it with his Return to the Forbidden Planet in the early 1980s, mingling in '60s pop tunes, to boot. That production interweaves various lines to serve a real plot, however vacuous it may be. There's a plot with William Shakespeare's Long Lost First Play (abridged), too, but as half of the show is really about RSc presenting the play, the comedy here is more a collection of skits combining low-brow humor with high-brow concepts while throwing in a bunch of brow-furrowing puns along the way. It's fitting, here, to recall Richard III telling us, "If I can't prove a lover, I'll prove a vaudevillian." I think it was Richard who said that; after awhile I lost track of who said what and when, and I couldn't write in my notebook fast enough so furiously did the jokes come at us. At least Dale sticks out in my recollection. Teddy Spencer's Ariel is passing through the front row describing to Puck how he came "Over hill, over Dale," and then apologizes to "Dale" sitting there. Further down the row he passes "over Gale," again apologizing to the woman he justles past, though he appreciates his brief interaction with her. Later, "Dale" and "Gale" are called upon to manage the turbulent sea during the tempest while other audience members in the front row provide the sea spray—which the actors return before the scene is over (caution: first three rows are a splash zone). As the play continues, "Dale" gets quite a few mentions, including in the epilogue, an example of the RSc creators wringing as much unexpectancy out of a joke as they can. Then there are the puns. Oh man, the puns: Hamlet has an edible complex, the women are so pantsy, and the Egyptian queen has a great asp on her. King Lear's second daughter is named Genital Wart, and Puck at one point tells Ariel, "a Puck is exactly what I don't give." Falstaff enters to "A whore! A whore! My kingdom for a whore!" and the poet Orlando, we are told, goes on to design amusement parks. Which brings us to the topic of Disney. Spencer first appears as a mermaid to play Ariel. Though Martin and Tichenor admonish him for depicting the wrong Ariel, Spencer replies with a convincing argument (that is, convincing in the context of this production) that Disney and Shakespeare have more in common than first meets the eye. This sets off another line of running jokes that last out the play, from Ariel singing songs from The Little Mermaid during the tempest to many off-hand references to other Disney movies and characters. They are, in part, poking fun at the hooey about The Lion King being a remake of Hamlet (which gets a direct mention here). They also are examples of one of this play's richest veins for drawing laughs: pop culture references and, as we are at the Folger, three blocks from the U.S. Capitol, multiple political jokes, too. Nevertheless, the Disney references that keep popping up begin sounding like the fodder for a legitimate thesis on the relationship between two giant show business icons, Will and Walt. Which, for me, represents one of the keenest delights of RSc's work. Despite the slapstick and antic dispositions, there's rich intelligence and deep appreciation of Shakespeare in the company. And it is through William Shakespeare's Long Lost First Play (abridged)'s fabric of repurposed lines and cross-purposed characters that we gain even greater appreciation for Shakespeare's playwriting skills, too. It's notable that, after all the magic that's run amok in the plot of this play, only Shakespeare can get us out of it because "he's the greatest magician of all." But Disney comes a close second.